Attention-deficit/hyperactivity disorder (ADHD) is a neurologically based condition that often affects an individual across the lifespan. By definition, it begins in childhood, and includes symptoms of inattention, hyperactivity, and impulsivity that cause clinically significant impairment in multiple settings (American Psychiatric Association, 2002). In addition, there is behavioral, social, and neuropsychological dysfunction associated with this disorder. 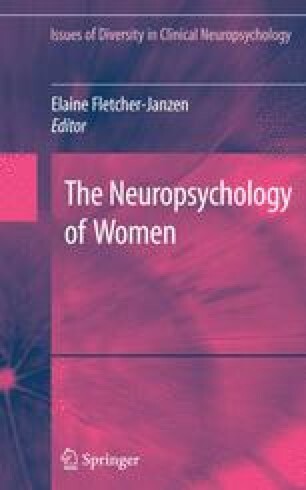 In this chapter, we will explore various facets of ADHD in relation to girls and women. In particular, we will include a description of the disorder, including diagnostic criteria, characteristics, prevalence, and neuropathology. The assessment of ADHD from a neuropsychological perspective will be discussed followed by a case example. Various aspects of intervention will be examined and critiqued. Finally, this information will be summarized and future directions in the field will be explored. Cogmed working memory training. (2007). Retrieved April 28, 2007, from http://www.cogmed.com/cogmed/. Phillips, J. A. (2001, May). Thyroid hormone disorders. ProQuest. Retrieved April 21, 2007, from www.csa.com/discoveryguides/thyroid/overview.php. Schweitzer, J. B., Hanford, R. B., & Medoff, R. (2006). Working memory deficits in adults with ADHD: is there evidence for subtype differences? Behavioral and Brain Functions, 2. Retrieved May 24, 2007, from http://www.behavioralandbrainfunctions.com/content/2/1/43.